If you're a fan of relaxed dressing when it comes to your personal style, you'll love this super cute combo of a black open cardigan and black ripped skinny jeans. 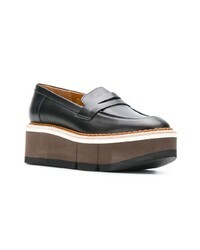 As for the shoes, go down the classic route with Clergerie platform penny loafers from farfetch.com. Try pairing a light blue denim jacket with black leather leggings, if you want to dress for comfort without looking like a slob. Rocking a pair of Clergerie platform penny loafers is an easy way to add some flair to your look. If you're in search of a casual yet totally chic outfit, try pairing a charcoal coat with blue ripped skinny jeans. Both pieces are totally comfy and will look fabulous paired together. And if you want to instantly up the style ante of your look with one piece, add black leather platform loafers to the mix. A black coat and black capri pants are absolute staples if you're picking out an off-duty wardrobe that matches up to the highest sartorial standards. When it comes to shoes, this look is finished off wonderfully with Clergerie platform penny loafers. If you're scouting for a casual yet chic outfit, try teaming a white coat with grey skinny jeans. Both items are totally comfy and will look fabulous paired together. When it comes to shoes, this outfit pairs nicely with Clergerie platform penny loafers. If you're scouting for a casual yet totally chic getup, consider wearing a light blue denim jacket and a black skater dress. Both pieces are totally comfy and will look fabulous together. Bump up the cool of your look by complementing it with Clergerie platform penny loafers. If you're on a mission for a casual yet totally stylish ensemble, dress in a white and black polka dot blazer and a black skater skirt. Both items are totally comfy and will look fabulous together. Got bored with this getup? Enter Clergerie platform penny loafers to shake things up. If you're on the lookout for a casual yet totally stylish outfit, team a charcoal shearling coat with black skinny jeans. Both items are totally comfy and will look fabulous paired together. Black leather platform loafers look amazing here. For a smart casual getup, opt for a charcoal fur jacket and white vertical striped skinny pants — these items play perfectly well together. 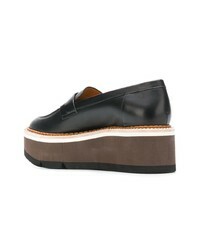 When it comes to shoes, this ensemble is finished off nicely with Clergerie platform penny loafers from farfetch.com.